A great market street lined with restaurants, just a short distance from the Eiffel Tower! 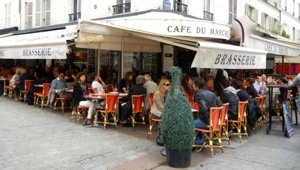 Rue Cler (7th arrondissement) is a great place to go for lunch after visiting the Eiffel Tower. This busy market street has everything you could want, from meat to flowers to olive oils to honey. It's largely pedestrian, which makes it nice for strolling. It has a lots of cafés if you want to sit and eat, or you can buy a sandwich or picnic supplies from one of the many vendors. On a warm day the outdoor tables at the many restaurants will fill up, as both local residents and tourists take advantage of the fresh food and reasonable prices. Most of the restaurants are French cafés, but there are also several Traiteurs featurning Asian food. Rue Cler is a compact street that runs between Rue de Grenelle and Avenue de la Motte-Piquet. It is a great reminder of the importance of good food to the French. 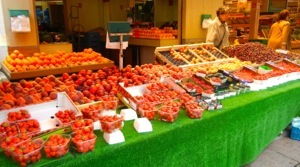 People living in the area will shop daily, choosing fresh seasonal produce (cherries, peaches, and strawberries were all in season when I was last there), buying meat for dinner, selecting from among hundreds of kinds of cheese, and of course picking up a fresh baguette at the boulanger. Although tourists without a kitchen will be limited in what they buy, you can feast with your eyes and enjoy some snacks. You can easily walk to Rue Cler from the Eiffel Tower or from Les Invalides. Or take the Métro to École Militaire or La Tour-Maubourg. Bon appétit! Want a picnic or snack instead of a restaurant meal? Plenty of fresh fruit to choose from. Above, Busy lunch time at a café on Rue Cler, Paris.